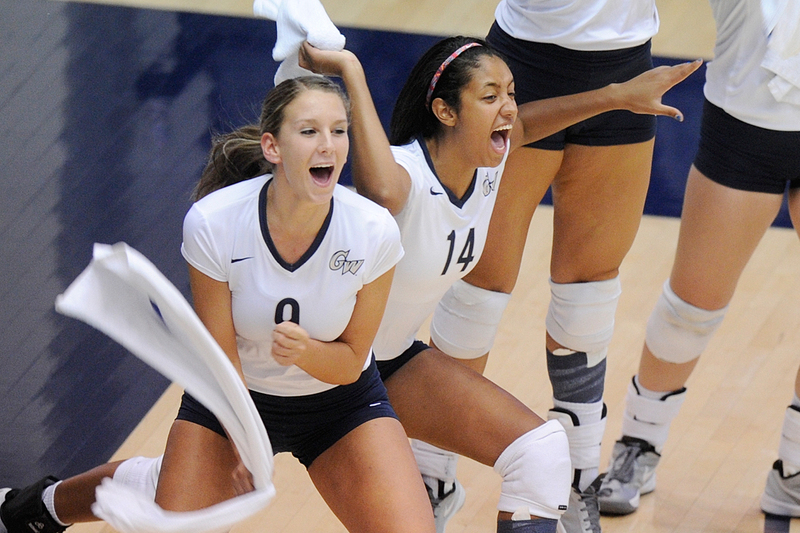 The Towel Gang (name self obliged) is the GW volleyball team's in-house spirit section, made up of whichever players aren't in the match at that moment. Led by junior Natalie Leger, Towel Gang president and godmother, the players wave custom towels, make noise and celebrate aces, kills—anything— with skits and silliness that pick at even coach Amanda Ault's coldest poker face. "I have to look away because it will make me start to laugh," the fifth-year coach says. "I just can't believe what's going on down there." It's choreographed chaos, meant to distract and annoy opponents, but entering its third year, the Towel Gang has transcended strategy. "It means a lot to the culture of the team," Ms. Ault says. "The Towel Gang, it's just their energy, the chemistry they have with the girls who are out there and just being a group as a whole." The Towel Gang is representative of that group, and this season, led by All-Atlantic 10 standouts Chidima "ChiChi" Osuchukwu and Jordan Timmer, it will be as important as ever. GW is coming off its best season since 2000, going 22-8 overall and 11-3 in the A10. The Colonials made the conference title game last year but lost to host Dayton, the top seed, in four sets. GW was seeded second, and this year the Colonials are in position to make a run at their first conference title and NCAA berth since 2000. "I think we're all just angry. I'm angry," Ms. Osuchukwu says. When the team loses to a rival, "especially at home, it gives them so much momentum … and they feel like they're better than you, and we feel like we're just ready to go out and prove ourselves," she says. "I think last season we did really well, but we can do better. We will do better." Back from that team are five starters, led by the 6-foot Ms. Osuchukwu. The junior middle blocker led the A10 in blocks per set (1.47) and total blocks (162), marks that ranked ninth and 18th, respectively, in Division I.
Ms. Osuchukwu also was third in the A10 kills per set (3.74), en route to being an American Volleyball Coaches Association All-American honorable mention and earning a tryout in Colorado Springs, Colo., with the various U.S. national teams. Only 232 college players were invited. There are 328 Division I schools, 90 of which had representatives at the prestigious scouting combine. Ms. Osuchukwu, who was picked as an alternate for one of the teams, says the experience showed her the effectiveness of finesse—that kills count whether they love-tap the floor or crater the face of some poor libero. "I would always just swing away, swing, swing, swing," she says. "And I would think power equals strength, and strength is good, and good is, you know, winning." Returning with Ms. Osuchukwu are senior defensive specialist Maddy Doyle, sophomore outside hitter Aaliyah Davidson and Ms. Timmer, a senior setter and key cog in GW's fast-paced, attack-minded offense. In 2014, the Central Michigan University transfer averaged 10.79 assists per set, which ranked third in the A10 and 50th in Division I. Last year's A10 title match still bugs her, too. "The whole day was surreal, kind of," Ms. Timmer says. "It was weird. We were so amped and ready and practice was good, and then we just weren't in control of our side of the net." This season, it will be their net. The Charles E. Smith Center is hosting the 2015 A10 tournament Nov. 20, and the Towel Gang is already planning a membership drive. "It's so much more momentum because we're in front of our home fans," Ms. Timmer says. "All of our students can come. … Last year we played at Dayton, and their student section was in our face. So now, we can just do it right back. That's kind of nice."